We love Italian food in our home, and a frequent quick meal our kids yell for is a quick dinner of pasta with a sausage sauce. 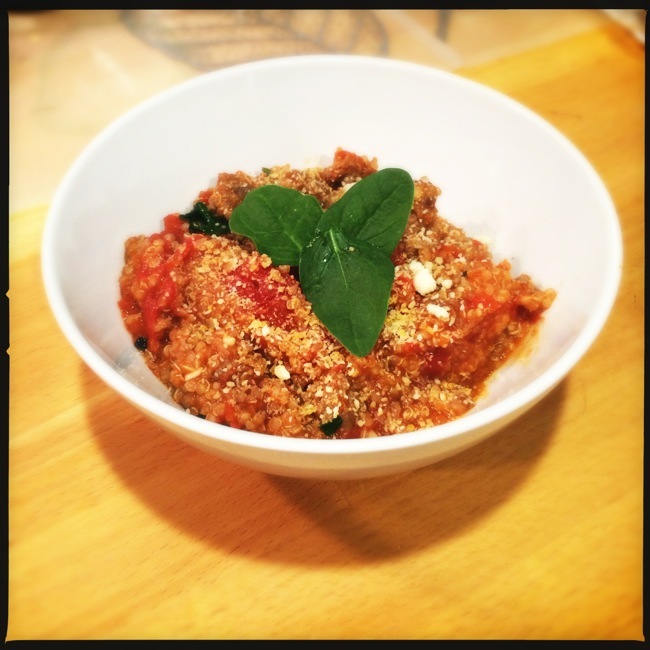 I decided to try and take it to another place tonight by using quinoa to make it gluten-free and Paleo friendly. Roasting the tomatoes take a lot of extra time, but cooking the quinoa will take most of the 50 minutes or so you will need to roast off the tomatoes, and trust me, there is no way to substitute the depth of flavors you will get unless it is summer time and you can throw whole tomatoes on the grill to slow roast them there. The spinach will add some great contrasting flavor in addition to the contrasting color it brings, and you can add more than I did if you want more greens, but my kids were rebelling even with this. Give this one a try, no fat boy will taste it and believe they are eating as healthy as they are, and that is the point of good cooking. If it tastes as good as the stuff that is bad for us, we are a lot more likely to eat it without complaint. You can enjoy the flavors you love and stll avoid the bad carbs that are dragging you down. Using quinoa instead of pasta in this dish makes it 100 times more healthy and doesn't really add anything to the prep or cooking time. Roasting the tomatoes takes a long time, but trust me when I tell you that if you take the time you will not regret the fort. Preheat oven to 425 degrees. Line a rimmed baking sheet with parchment paper. In a medium bowl, break up tomatoes with your hands. Mix in garlic and olive oil. (You will include the juices from the tomatoes) Salt and pepper to taste. Roast for 40 to 50 minutes, stirring occasionally. Meanwhile, cook sausage according to package directions. Slice thin or crumble. Heat quinoa in a large pot. Add in tomatoes, sausage and spinach. Cook until spinach wilts.